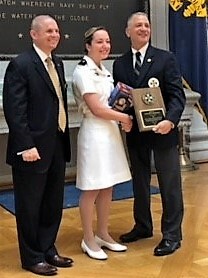 Captain James F. Brooke, III Memorial Division of Humanities & Social Sciences Award: Midshipman 1/c Cara M. Edwards, for her paper “Navy Shipbuilding Programs and Force Structure: Achieving a 355-Ship Navy.” Joining RADM Loren and the award recipient in are Naval Academy Academic Dean and Provost Dr. Andrew T. Phillips and Chair of the Humanities and Social Sciences Division Colonel Jon Aytes, USMC. This year's awards were selected from 21 finalists. 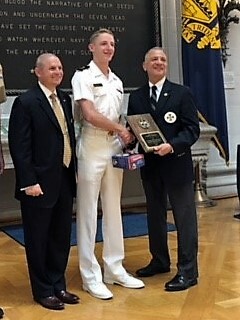 The 2018 recipients were Midshipman 1/c Cara M. Edwards, Midshipman 3/c Joseph N. McGraw, and Midshipman 4/c Justine A. Ransdell. 2018 is the 84th consecutive year that the Naval Order Prizes have been presented. National Capital Commandery Life Member and Assistant Secretary of Veterans Affairs, RADM Don Loren, US Navy (Ret.) represented the Naval Order at the Division of Humanities and Social Sciences Awards presentation on 23 May. Admiral Loren has presented these awards for the past four years after taking over this responsibility from long time award coordinator, the late CAPT Jim Brooke, US Navy (Ret.). This year marks the first year that the senior division award has been officially named in CAPT Brooke’s honor. 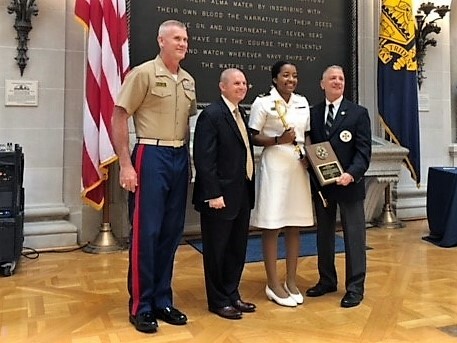 RADM Loren is a 1974 graduate of the Naval Academy, served as Deputy Director, J-5, for Political-Military Affairs on the Joint Staff and has a long history of national and international security assignments on the OPNAV, Joint, and Secretary of Defense staffs.